Product #3837 | SKU KSM141-SL-ST | 0.0 (no ratings yet) Thanks for your rating! 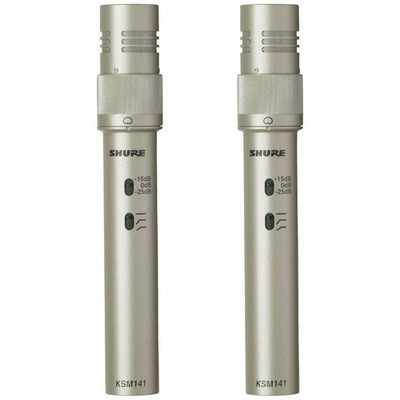 The KSM141/SL ST PAIR from Shure is a stereo pair of switchable-polar-pattern condenser studio microphones designed for instrument recording and sound reinforcement. The capsule's pattern is switchable between omnidirectional and cardioid pick up. Omnidirectional offers a more generous pickup area while cardioid offers attenuation of noise and ambience at the off-axis sections of the microphone. In addition, the microphone offers a wide 20 Hz to 20 kHz frequency response making it a flexible solution for a variety of applications. The KSM141/SL's element features a permanently biased transducer design resulting in clean, accurate signal reproduction and frequency response. The transformerless Class-A output circuitry provides a noise-free-output signal path while maintaining high gain levels. There is a 3-position low-frequency roll-off switch, eliminating low-frequency rumble noise and counteracting proximity effect. The KSM141/SL handles high sound-pressure levels and features a 3-position pad switch providing attenuation at 0, 15, 25 dB. This allows for confident miking of instruments high in transient response such as drums, percussion, and brass. The microphone is also suitable for recording piano, strings, guitar, and woodwinds. The KSM141/SL ships with a case, two microphone clips, two foam windscreens, and the A27M stereo stand adapter. The KSM141/SL features switchable polar patterns. Omnidirectional offers a generous pick up pattern suitable for recording ambience, vocal groups etc. The cardioid pattern is tighter and provides effective rejection of off-axis signal. The transformerless, Class-A output circuitry provides a noise-free output signal path while maintaining high gain levels. The KSM141/SL provides flexible low-frequency attenuation, eliminating low-frequency noise and rumble. The 0, 15, and 25 dB Pad switch adds greater SPL-handling allowing the microphone to withstand high audio levels without distortion. The microphone offers a wide 20 Hz to 20 kHz frequency response making it a flexible microphone for a variety of applications.